Happy Friday everyone! I hope that you’re all managing to carve out a little “me” time for crafting during this busy season. 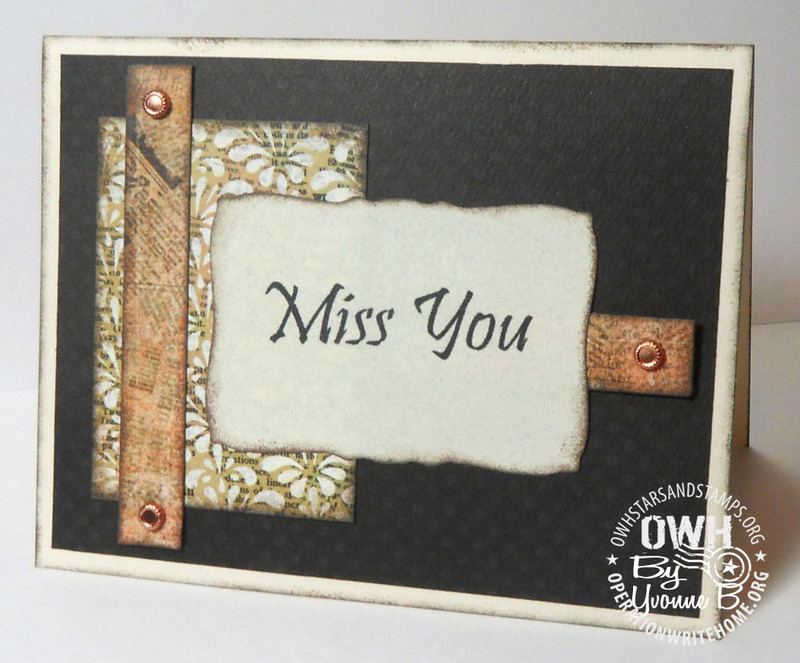 I’m excited to be able to share a beautiful group of cards made by this week’s featured cardmaker Yvonne to help keep your mojo going. Yvonne blogs over at Penguin Papers where you’ll find even more inspiration and of course you can say hello and leave a comment for her here at the end of this post. I’m not exactly sure, but I think it has been well over ten years now. I don’t have a craft room. I use the dining room table most of the time, which can be rather inconvenient at Thanksgiving and Christmas when we actually feed people on it! Thank goodness we have a kitchen table for our daily meals! I have shelves of storage in our basement where many of my supplies live. I don’t think I could come up with one favorite. I love playing with paper and ink. My cards are generally fairly simple, but I really enjoy mixing up several elements to make a design. I’ve always liked collage. I admire much of the stuff Tim Holtz does. 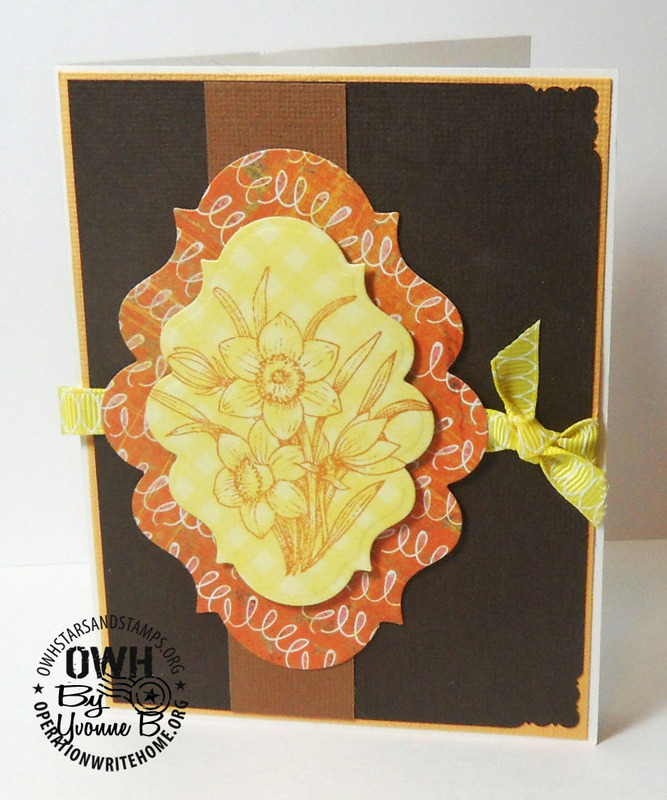 It is fun to play with different textures with embossing folders, ribbon, embossing powder, etc. I like to try new folds, like simple Origami, tea bag folding, and iris folding. I seem to be particularly drawn to greens and browns, but depending on the time of year and types of stamps you will see me use a lot of blues, purples, and even pinks. Some patterned paper combinations help me to change my outlook a little bit and put together colors that I might not have thought of. Two peers from a cardmaking forum: Barb H. (Paper Therapy Ponderings) and Cora (Cora Jean’s Paper Playtime) brought it to my attention. I’ve “known” them for a number of years and admired their devotion to making cards for the troops. For a while I didn’t think I had time to devote to it, but then I started participating in the challenges and doing some of the tutorials and here I am! I think about how isolated our soldiers are and how long they are away from their loved ones. Our cards may make the troops smile as they are writing home, and you know that the recipients really smile when they receive them! These may be treasured mementos that those families keep forever. I like sharing cards that I love to make with others and this seems like a way to show my appreciation for the hard work the troops do on our country’s behalf. Thanks Yvonne! Great samples! Hard to pick a favorite out of these. Thanks for sharing! Yvonne,These are great cards! 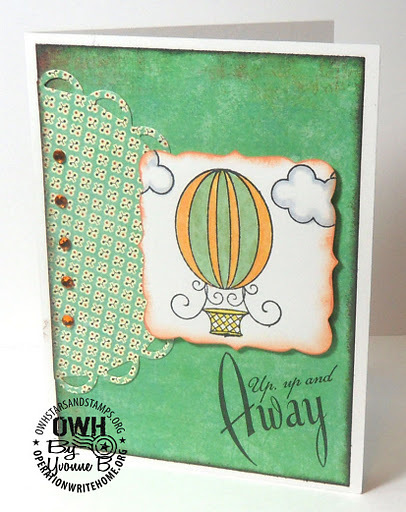 I really love the hot air balloon card,but they are all wonderful! Thank you for sharing! Yvonne – I cannot pict which one I like the best – as I read about you and saw your card – I though ahhh – this one – but then I would move down and the next one captured me! I have seen the square technique before – but never done this well – I absolutely love them! Great job – keep on sharing! Yvonne, your cards are so fun! I especially like the hot air balloon with the hills and trees. 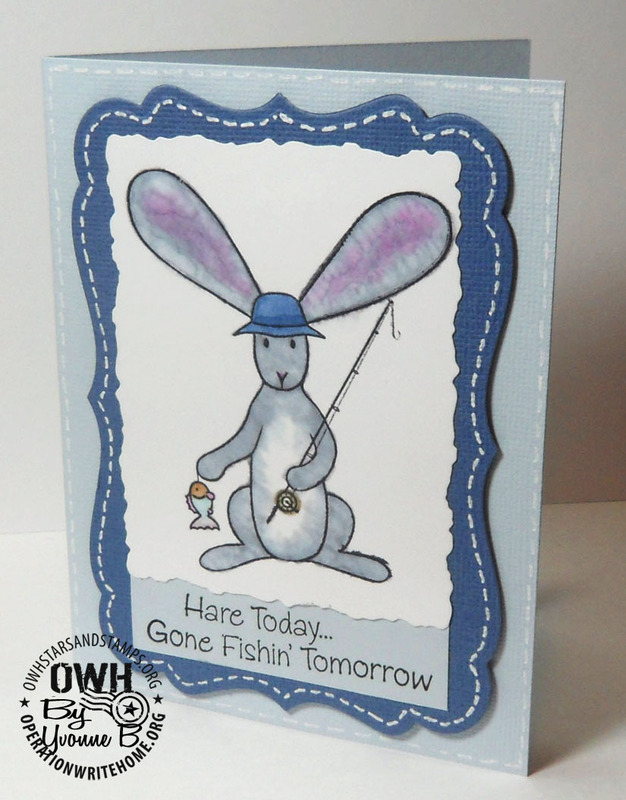 Annnd I like the hare today gone fishing card. Thanks for sharing your wonderful cards! Been lovin' the hot air balloons and you gave us not one, but TWO, samples. Beautiful work! Love all of your cards. Also love that you do for our troops! Was so excited to see you featured. Your cards on your blog are always so inspiring. I just hate messing with that log in thing on your blog. I am bad, I look and don't comment. Thanks for letting me share your cards with everyone this week Yvonne. The whole group is wonderful so picking a favorite is hard but I love the hot-air balloons and the floral with that fancy double framing is beautiful. Lovely cards, Yvonne. I liked them all, but am drawn to the geometric pinwheel. It could be used for so many occasions, just varying the choice of papers. I'm heading over to Penguin Papers to read/see more! Thanks for sharing in the OWH Projet.